Telephone Trottoire calls Congolese listeners, plays them a phone message on a topical subject and invites them to record a comment and pass it on to a friend by entering their telephone number. The project builds on the traditional Congolese practice of ‘radio trottoire’ or ‘pavement radio’, the passing around of news and gossip on street corners to avoid state censorship. 90% of Congolese people in the UK are refugees and their mistrust of official media has made them a particularly isolated community. Yet Trottoire has proved very popular. This was the second version and ran for 6 months over 2008 and early 2009. Combined with the first 2006 version has now grown to include 1,800 users and archived 1,300 comments. Since August 1998 there have been 3.9 million deaths and over 361,000 refugees created by the so-called ‘coltan wars’ in the Congo region. Coltan ore is mined for the metal tantalum - an essential component of mobile phones and other communication devices that is now coveted by dozens of international mining companies and warring local militias. Although the conflict has continued up to the present day it remains almost entirely unknown outside of Africa. ‘Telephone Trottoire’ is a ‘social telephony’ network aimed at the Congolese community in London, approximately 90% of whom are refugees or asylum seekers. In the Congo, where free speech has been censored for over forty years, people spread information while standing on street corners – by 'radio trottoire' or 'pavement radio'. Produced by the artists in collaboration with the Congolese radio programme ‘Nostalgie Ya Mboka’, ‘Telephone Trottoire’ calls people up and invites them to pass around stories or topical news items over their phones. So far there are two installations in this series. “Tantalum Memorial – Reconstruction” was the first version, commissioned for the Zero1 Biennial “Superlight” show at the San Jose Museum of Art, May 10th - August 31st, 2008. 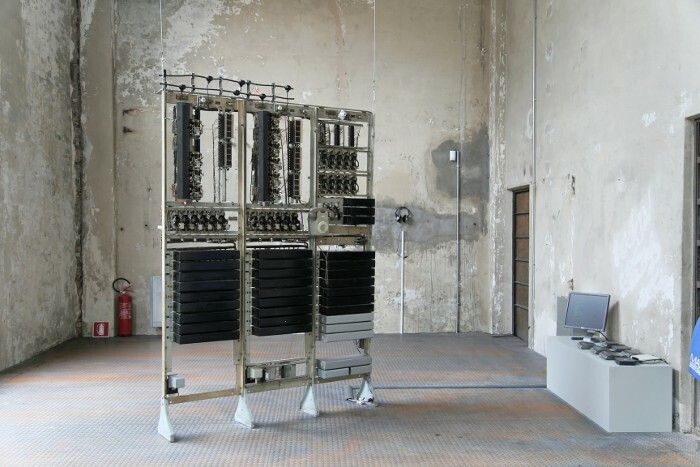 “Tantalum Memorial – Residue” was the second in the series, this time utilizing a 1938 telephone exchange rescued from the old Alumix factory in Bolzano, Italy. This was also the site of Manifesta 7 - the European Biennial of Contemporary Art, where it was exhibited 19th July to 2nd November, 2008. "Trapped in Amber" (cat. ), UKS Gallery, Oslo (as part of “Africa in Oslo”), February 21st to March 22nd 2009. “Tantalum Memorial & Phone Wars”, TAP Gallery (CoExist Arts), Southend-on-Sea, UK, July 23rd to August 9th 2009. “After the Net”, Plymouth Arts Centre, UK, September 12th to October 23rd 2009. “Cyberarts”, OK Centre for Contemporary Arts, Linz, September 3rd to October 4th 2009. “Pronto! On Telephony”, PLUG.IN, Basel, September 3rd to November 8th 2009. “Feedforward: the Angel of History” (cat. ), LABoral Centre for Art, Gijon, Spain. October 23rd 2009 - April 5th 2010. Tantalum Memorial - Reconstruction May 10 - August 31, 2008 is A FUSE Commissioned Residency for the 2nd Biennial 01SJ Global Festival of Art on the Edge , ZERO1, CADRE Laboratory and the Lucas Artists Program, Montalvo Arts Center. Tantalum Memorial – Residue was commissioned by the Raqs Media Collective for Manifesta7 - the European Biennial of Contemporary Art, Bolzano, Italy, July 19 – November 2, 2008.